I have not read this book yet, but I’ve gotten rave reviews from my friends. 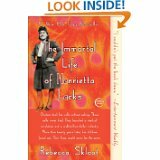 I had no clue who Henrietta Lacks was or why she is important to us. I know. Henrietta died from cervical cancer but cells removed from her body, without her knowing and without her permission, were sent around the world to be used for polio vaccines. Find out here.